The 2016 Cougar Mountain Trail Run Series begins this weekend! Saturday, May 14 marks the first race in the annual Cougar Mountain Trail Run Series. Since 2003, participants have raised over $155,000 for King County Parks. Way to go, runners! There are a total of five races throughout the summer and fall. Participants have the option to run one race or challenge themselves to complete the whole series. For the first race, runners can run either a five or 10-mile course that meanders through the lush forest and trails on Cougar Mountain. 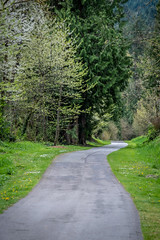 This is a great opportunity to explore news trails and support King County Parks. We hope to see you there! Saturday, June 11, 2016. 8.2 & 14.5 mile & 5 km: 9:00 a.m. Start. Saturday, July 9, 2016. 10.8 & 19.5 mile & 5 km: 9:00 a.m. Start. Saturday, August 13, 2016. 14.5 & 26.2 mile & 5 km: 8:30 a.m. Start. Sunday, October 30, 2016. 19.5 mile & 50 km & 7.6 mi: 8:00 a.m. Start.